At any rate, we weren’t alone, because right there with us were lots of big rigs pulling into the parking lot at the same time. When the doors opened at 7:00 a.m., we were all there like a bunch of pigeons. Still seemed like chaos to us. But low and behold, soon after we sat down in the waiting room, along with 50 other retirees, order seemed to take over. It reminded me of a hospital waiting room. One “service technician” at a time came out of a door and called a name. That service tech would come over, shake the hand of the owner of the rig, and sit down to discuss what the issues of the day were. Pretty soon, a nice fellow named Larry came out of the door and called our name. He shook Greg’s hand and talked with us about installing the awnings. Greg asked if the screws were stainless steel or aluminum (you know Greg) and he answered that the screws were aluminum. That’s good, you know. So Larry takes the keys to the View and disappears with it behind the outside service doors. In the meantime we are getting to know all the folks sitting around us. 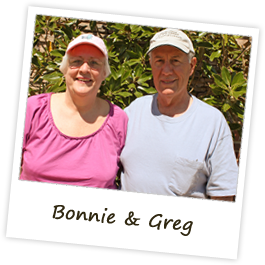 Retirees who travel are such an interesting bunch. We met folks from all over, and everyone was in such a jolly mood. They told stories of their travels, things that have happened (funny and not so funny) and basically enjoyed the wait time. Some of the folks read books, some of the women did crafts, some of us wished we were asleep, and it got to be a big joke when someone would say “what time is it”, and the others would groan and say “it’s only 7:45 a.m.” Quite funny, but I guess you had to be there. One couple was just returning from Alaska, so they gave us some good info. We went over to the visitor center intending to go on the plant tour, but when we arrived, the hosts in the visitor center said they were expecting a bus full of “seniors” who were coming over from a nearby town to take the tour. We waited and waited and they did not show up and the tour was not going without them. We were the only two people other than the “seniors” to take the tour, so they were not going to leave without them. 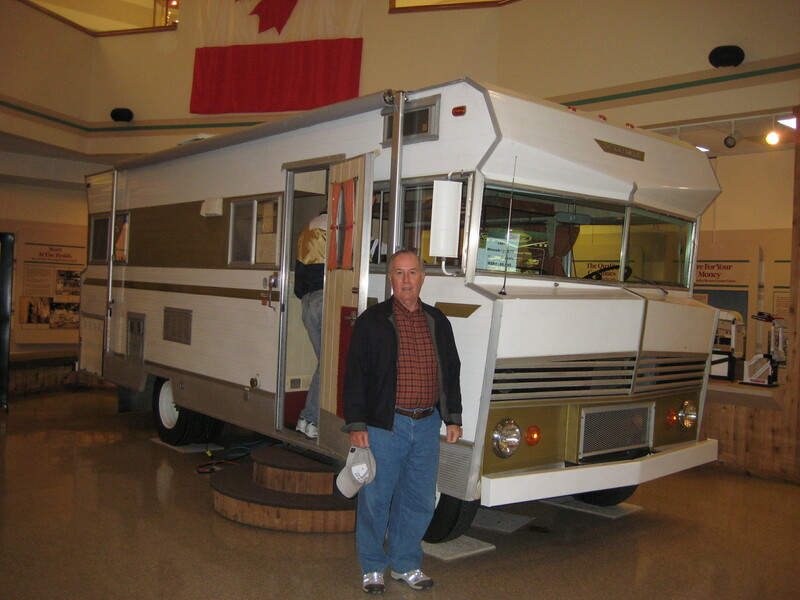 We enjoyed the museum in the visitor’s center showing the history of the Winnebago. We decided to forego the tour since we had seen the documentary about the plant. The hosts said that the tour had been greatly curtailed due to recent loss of employees (Layoffs). We thought there might be a chance that Larry would have our rig finished so we headed back to the service center. Shortly we saw Larry pulling our rig back into the parking lot. 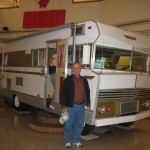 He showed us what he had done and how to use the awnings (pull them down, pull them up, I can do that). We headed out around 11:00 a.m. and drove all day arriving in Galesburg, Illinois this evening. OK, I’ll admit it, we are tired tonight, so we decided to stay in a Holiday Inn Express. I know there’s a joke in there somewhere, but I cannot for the life of me remember what it is. We talked with Ben and he laughed saying, “I think this is the 3rd night you’ve stayed in a hotel since you left home”. OK, OK, Ben, don’t rub it in. Three days out of 27 is not that bad, is it? This morning a nice lady talking with us said that once she’s on the way home, she just wants to get home. This from a lady who has been gone from home since May! But we know what she means; we are tired, and it’s just not as much fun driving home as it was driving westward. But what a great time we’ve had. We hope to get down toward Paducah, KY, by tomorrow evening (yes we will camp somewhere) and then get back home on Thursday evening. Stay tuned.